Down the Haw River I watched as these two immature bald eagles got into a squabble. The eagle to the right had just gotten knocked off the branch it was perched on, by an older eagle. The eagle to the left seemed to resent the disturbance and faced off with the other youngster. The encounter stayed a bluff on both sides and they both found new perches elsewhere. 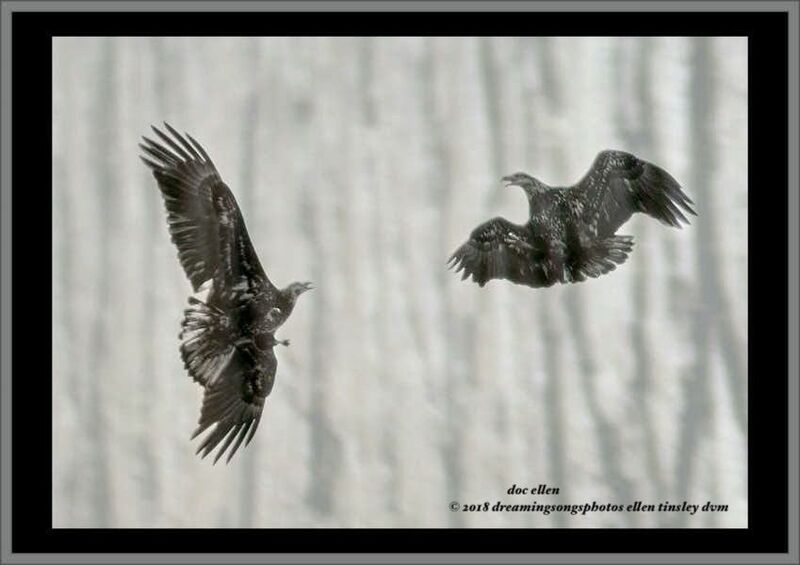 Posted in birds, black and white photography, Eagles of Jordan Lake, Haw River, Jordan Lake, Jordan Lake State Park, photography, raptors, wild birds and tagged as American bald eagle, bald eagle, bald eagle flight, bald eagles of Jordan Lake, eagle, eagles of Jordan Lake, immature bald eagle, immature eagle, Jordan Lake, Jordan Lake State Park, raptor. The intensity of the postures looks as though a strike has to happen. These “war” behaviors will pay back some day with a prize fish lunch or breakfast or dinner. The shot you shared is really intense and the B&W version is very effective in conveying their mood over the water. Sometimes there is absolutely nothing like black and white photography to portray the intensity of action. Glad you like the scene!